Last time we flew out of at Tulsa International, there were 400 people in line at 5:30 am. That Saturday morning, there wasn't a soul to be found. Sometimes two hours isn't enough time, and sometimes 30 minutes will do it. Then we got a nine-hour reminder why we don't have kids. Screaming, kicking, screaming louder, kicking harder. from pressing the "Call Button" every 2 goddamn minutes? Isn't it odd that parents need to be told to lease their little monsters? So we're flying over NYC, heading for Islip, NY, where SWA lands. we're gonna hit the breaks like crazy so hold on and maybe say a prayer." The passengers applauded when we landed safely. I thought they only did that in damn movies. Audio Clip One For BCR Subscribers - we'll make it available to everybody soon. 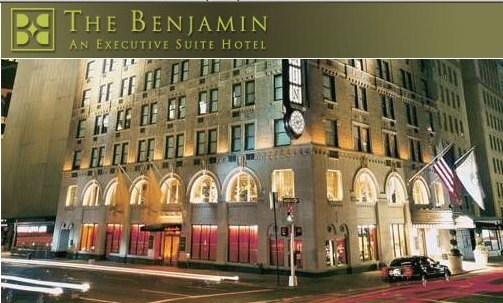 We checked into a fabulous hotel called The Benjamin. They have a Pillow Consierge - for free. Not sure what that means, but we don't need some other dude in our bed. Here's the view out our window. This is from the 16th Floor which means nobody on the street can see it. 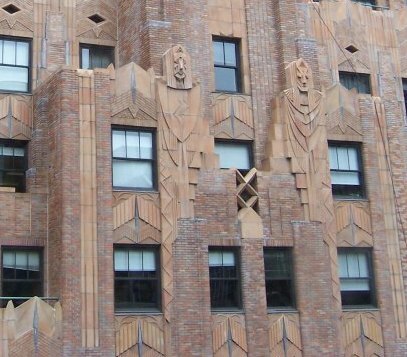 Why spend so much extra for art that only patrons of the hotel across the street can see? I contacted Mr. White, who will now go by the name "Frank." going to dinner with Mr. White, ...I'd bet, is a lot like going to dinner with Sinatra. walks into a restaurant, casino or hotel, it's like being with E.F. Hutton when he speaks. And no, his real name isn't Frank White. on what a NY newbie might call the Upper West Side. Hey, I've been to New York before. You wouldn't believe what this apartment must've rented for. West side, this ultra-fine Manhattan apartment could've gone for as much as $2300 a month! I met some people that the average Okie isn't likely to meet. One fella's name was Greg, and he was waaaaay into American history. to Lincoln that the German Zeppelin had blown up in New Jersey" - something like that. the Center of the Universe with three high-end Entertainment Attorneys and Greg the Historian. Greg, who gave me permission to use his name, is what you might call "highly accomplished." so if that contract goes to a dude named Greg, odds are it's our new friend. Like Tommy Mack, Greg started out playing keyboards in a band. As time went by, he realized he had a talent for hooking things up and making them work. Now he hooks up really, really big things - after he invents them - and makes them work. ...tequila was consumed at this party - that's OK, nobody was driving. but Southwest Airlines doesn't always offer every convenience - like landing in NYC - because it's free. That reminds me - I got a funny cruise-don't cruise story for you. Lots of weird things happen when you have with a litigator. So we're going to eat some Italian. It looked just like the restaurant where Michael shot Solozzo! but they knew enough English to take our food and beverage orders. Even the busboys looked like extras from Goodfellas. Il Vagabondo is billed as the only indoor Bocce ball Italian restaurant in New York. 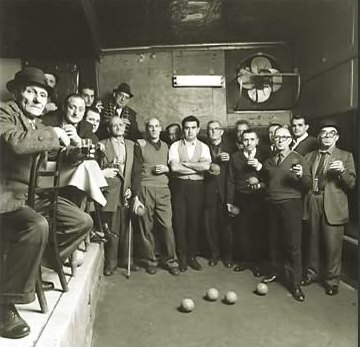 My old friend Frank said we'd be playing us some Bocce ball at Il Vagabondo. the left looks exactly like the restaurant manager, so I don't know. So we walk into this place, I'm holding on, trying not to let my "Okie" show. As you know, I'm one of the smartest people in Oklahoma - for sure. in the room and that caused me to do a whole lot more listening than speaking. kinda like hearing Dr. House talk to his medical team on TV. how stupid I am so I just clammed up and enjoyed the over-my-head conversation. We eight sat at a big, round table and the uber-Italian dudes brought us menus. Then I had my first hallucination. "We're 'A' players, make us happy!" Is that what it takes to bring out the good veal in an Italian restaurant in New York? "No red stripe, no great veal." but Frank knew the code so they treated us like royalty. (Rumor has it John Gotti loved the Veal Parmigiana at Il Vagabondo! and Frank doesn't shy away from telling them. Usually, the answer was "More champagne!" 100% totally honest and you're NOT going to believe this. if he'd like to gamble double or nothing on the evening's tab. That's the truest statement in this whole story. "It depends on the game!" If I was going to make something up, I could do better than that. But it really happened, or I'm not an Eskimoe* named Ned. We proceeded to have fine food. I ordered the Chicken Milano, because I think Alyssa Milano would be a fun date if I was single. Oh, and did I mention that to my left was ...The Beatles' attorney? and I've never sat next to The Beatles' attorney before. Beatles recording, you'll hear from my good friend Paul and he'll decide what damages are. but facing him in court would be like facing Gus Hansen at a poker table. I guess that why The Beatles, Elton John and Jay-Z etc. depend on him. Frank continued to "hold court" at the table. Frank was all "Bring me some honey fried mushrooms!" and they were all, "We're out of the honey fried mushrooms." And Frank's all "WTF?" so they countered with an offer and peace was achieved. As the night grew slim, it was nearing 11 and we were anticipating some Bocce ball. be playing Bocce ball tonight ...and then the unfortunate happened. the apartments above the4 restaurant that no Bocce ball would be played after 11 PM. (Bocce ball is related to bowling - ball busting - at an Italian restaurant in New York? This one attorney at the table objected. Frank looked at me and said, "That's MY lawyer!" He was Frank, high profile uber-litigator, saying "Get me this one attorney!" if he gets arrested. So Frank and Lorn played Mrs. Bart and me in some Bocce Ball. Lorn seemed to know more about Bocce Ball than the rest of us. So we finally left there and stumbled several blocks past 3-4 closed taverns. We're all going, "WTF?" but apparently, when the Pope's in town, nobody goes anywhere so they all closed down early. Here we are - in New York City, just before midnight, and we can't get a drink? We kept stumbling, we kept finding closed clubs - WTF? Did we lose a war? What's it take to get a drink on a Saturday night in The City that Never Sleeps? Note: the bars in Tulsa stay open until 2AM every night. Then, as we were walking Greg (A.K.A. Dr Technoid) told me a very touching story. and Greg said it helped a little to have that connection. He made me feel like I did a good thing. Trenching on, we found Bill's, a tiny-ish pub on Madison Avenue. and 4-5 Golden Girls singing and dancing to everything he played. more red wine. One word someone used to describe Frank that weekend was "exhausting,"
left the piano unguarded and Frank sat down and played some very beautiful music. wonderful. Frank is full of surpirses, as you'll find out if you keep reading. which Frank had never played. could've been anti-climactic, but we had the best time - hell, we even won. the poker tourney, which came to a total of one dollar and twenty five cents. Yeah, Frank's got that kind of money. told me to and I'll be damned if he didn't win the entire tournament with his crazy poker moves! Together, we won $4.50, so now I gotta pay him $2.25 in cash.